All commands follow the basic rules of Apache since OHS is just Apache repackaged with small 1GB of extra stuff. The way that Oracle have configured the httpd.conf file is a bit odd/all over the place, but its been worse in older versions of EPM. This example uses the OHS which comes with EPM 11.1.2.3. 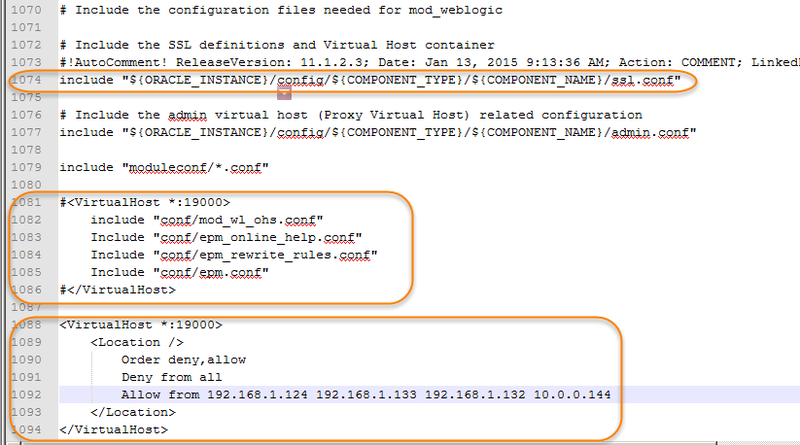 Then run with the default cert for testing or setup a new cert for the client by configuring the ssl.cont file (Doc ID 1530169.1 for full details). Remove/comment the <VirtualHost *:19000> and </VirtualHost> lines leaving what is inside. This will now apply the includes to the whole Apache instance. EPM will now work for HTTP as well as HTTPS. Client coming from allowed IPs will see the content on http and https. Alternatively you could redirect the denied user to the https url automatically, but I have not looked at that. Won't be much different though.